Valentine's Day hasn't meant much to me, really, since I was in middle school. In my mind I am actually fourteen, so that's probably why I'm totally obsessed with ♥ heart ♥ decorations ♥. I bought 21 pink and glittered heart picks from Dollar Tree with no real use for them. They're just adorable and that's all that matters. 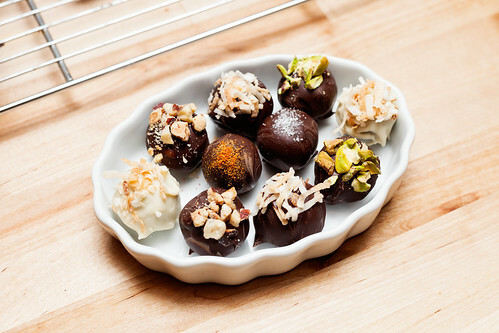 This Valentine's Andrew and I ordered delivery and watched "Paranormal Activity 4" while making homemade truffles using Jacques Torres' Chocolate Truffles recipe. 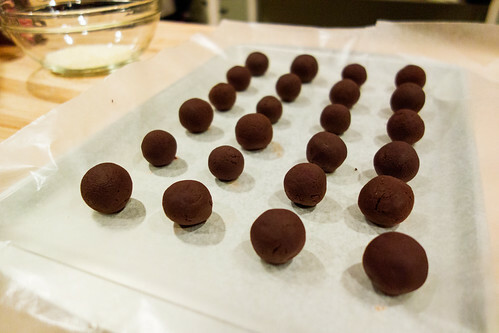 The recipe makes a whopping 180 truffles, so we quartered everything accordingly; in the end we ended up with about 30. The entire process was surprisingly simple albeit a bit time consuming. Totally worth it, though! 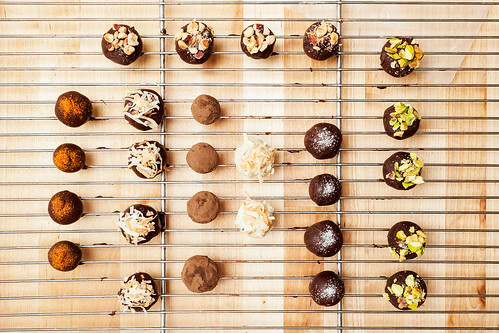 There are three components: ganache, enrobing chocolate and garnishes. 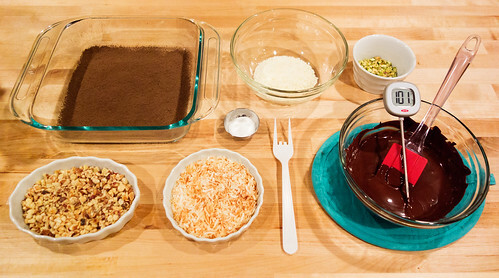 We opted to skip using alcohol in the ganache, and added a tablespoon of butter instead. 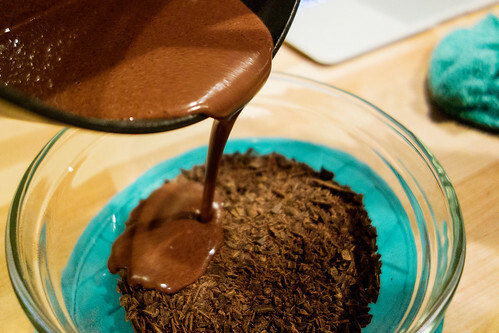 After combining a bit of the finely chopped chocolate with the heated cream, we poured it into the remaining chocolate slowly and continued stirring till smooth. There's a lot of food science going on here with temperature extremes and fat separation but you can read about that elsewhere! After pouring the ganache onto the plastic-covered cookie sheet, we mixed cayenne pepper into a small portion before refrigerating it. 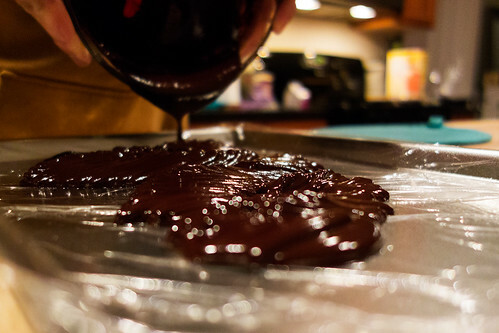 Once our ganache chilled, we began the tedious and cold(!) rolling process. 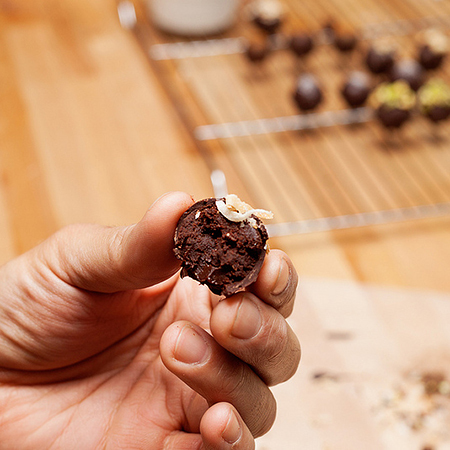 After every two rolls we had to dip our hands in ice water so the chocolate wouldn't melt in our palms. 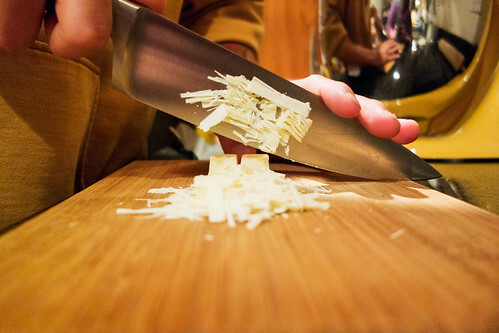 While letting those chill, we prepped garnishes. I toasted shredded coconut and hazelnuts, chopped pistachios, and Andrew chopped white chocolate despite both of us not really liking white chocolate. The most fun, aside from eating them, was the coating and garnishing! As much as I love cooking gadgets, I opted to use a plastic fork with the two middle tines broken off instead of buying a two-prong dipping fork. Worked like a charm! 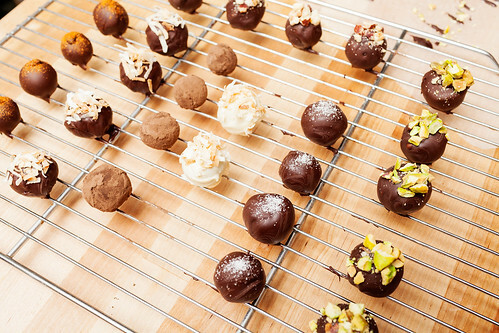 I didn't want to roll the truffles around in anything but the cocoa powder so I just sprinkled the toppings while they sat on the rack. 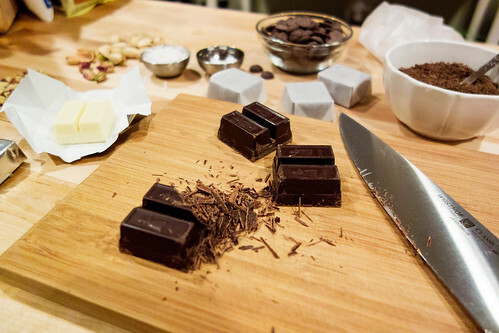 I didn't thoroughly read through the tempering process prior to making everything. Had I known, I wouldn't have used chocolate chips! Apparently chips have additives that prevent them from tempering properly. It's alright though, I don't need my chocolate to be shiny for it to be worthwhile. Andrew likes them all and refuses to name his favorite but my vote is for cayenne pepper, for sure! Sea salt is a close second. Next time I'll try some with more mix-ins. I think cointreau liqueur mixed in with orange zest garnish would be awesome. Cocoa nibs, espresso... ah, so many delicious possibilities! I definitely had one of those "these are almost too cute to eat" moments!